The facts: Telephone poll by Abt-SRBI for ABC News and the Washington Post., landline and mobile phone handling included. 1002 adults polled. No details I can see of the registered Republicans polled, as 16 questions are omitted from the release. With an MoE of 4 for the whole sample, we can probably guess at an MoE around 6 for the Republican part of the poll. Among registered Republican voters, Romney leads at 20. Perry and Cain are tied for second at 15. Third and fourth are two non-candidates who total 18% between them. I don’t need my software to tell me that an actual tie is an actual tie, and statistically Cain and Perry are in the same spot, with Romney ahead of them. Cain has caught up. If not allowed to pick Chris Christie or Sarah Palin, that 18% breaks 30 for Romney, 17 for Michele Bachmann, and 10 for Ron Paul. 17% of 18% isn’t enough to change the results, so the Christie and Palin factors don’t influence the top three and their positions relative to each other and to the rest of the field. Cain’s rise has been different from those of previous upstart candidates. Michele Bachmann’s rise coincided with the fall of Tim Pawlenty. Rick Perry’s rise coincided with Michele Bachmann’s decline. Cain however has risen without Perry falling off the chart. This is new and interesting. I expect some critics of Mitt Romney to panic about this, and fear that a “conservative split” will “let Romney coast to the nomination.” I believe that’s an unfounded fear. Not only are there three more months before the actual caucuses and primaries begin, but the early primaries and caucuses are not allowed under Republican Party rules to be winner-take-all affairs. 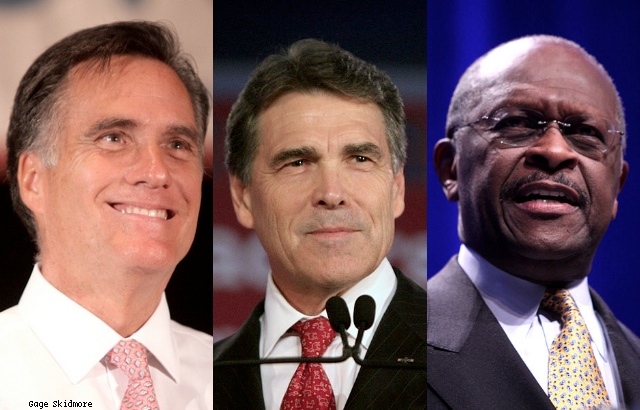 Therefore both Perry and Cain, assuming this situation continued to the primaries, could both tally up delegates, fighting it out with Romney to see who can remain standing. Party nomination processes are not randomly put together. They have evolved over the years to produce results favorable to the party and the party’s membership. Both Democrats and Republicans have been through this before. The party processes aren’t going to break down just because of a three way race, which is anything but unprecedented. Not only is Herman Cain a GREAT choice for our nominee as he is intelligent and has all the right makings for a conservative President, but the GOP would be foolish not to have him be the candidate to run against Obama. For all those Black voters out there who voted for Obama just because he was black (and we certainly KNOW this was the case for a huge number of them) Cain would give those Black Obama supporters (who are probably dismayed with him but would still vote to re-elect him) an opportunity to still vote for a Black man while voting for the RIGHT man.